When the FLC is switched off a number of genes under it switch on to initiate the process of producing first buds & then the mature flower, with different genes governing the specifications of the different parts e.g. petals & sepals. Some passion flowers are very hard to flower when taken away from their natural habitat, so what are the factors that switch the FLC gene off so flowering starts? This is the regular application of low temperatures to a plant, typically of say 3-8 weeks at 4°- 8°C. This will very slowly turn off the FLC. Then, often after a gap of a few more weeks, during which vegetative growth occurs, flowering is initiated. In 2000 The John Innes Centre isolated the FRIGIDA (FRI) gene responsible, again from Arabidopsis. When the gene is on flowering is prevented, which ensures that flowering is not initiated until spring. This gene controls whether or not a plant needs a winter period at all before it will flower. Obviously few Passiflora are thought to need vernalisation as they generally come from hot countries, but it is possible that some species such as Tacsonia & P. membranacea from the cooler mountain regions & P. incarnata which is hardy to-15°C/5°F may respond to cold though I suspect that day length is more important. Indeed as P. incarnata is herbaceous vernalisation may be needed to trigger vegetative growth as well. These need 12 or more hours of darkness to switch off the FMG & initiate flowering. Many spring & autumn flowering plants fall into this category. A very well known example is the Poinsettia. I have a P. actinia which flowers in May & also 6 months later in October. One year however it was hit so hard by winter frosts (–8° C/18° F) that although it was vernalised (severely!) it had virtually no leaf mass with which to feed back the critical day length to the apical meristem until after the day length was too long. So only the very first stem to grow produced 3 buds of which one flowered. This also tells us that FLC’s on the same plant are not always in the same state as although all the plant is growing profusely & should be flowering now it has missed its window & can’t catch up. So if you want a short day plant to flower profusely do not cut it back at all even when regrowth well established until after flowering. Some Tacsonia also come into this category if they start to produce buds in autumn as the day length shortens. The colder nights may also be a factor but the bud production seems too quick for vernalisation to be the main cause. So if you want Tacsonia to flower in UK leave them out in pots for as long as possible, though they may well die if planted out as its often just too cold. That said some such as P. reflexiflora flower in summer. These in contrast need less than 12 hours of darkness to initiate flowering. They are typified by plants that have a single flowering period over summer that may extend from July/August e.g. P. anfracta, to May to December e.g. P. caerulea & P. ‘Purple Haze’. Some very tropical plants need far less than 12 hours darkness & will need supplementary lightening extending day length to perhaps 16 hours to have any chance of flowering. Hard pruning once growth is restarted should not affect flowering of long day plants as all new growth should have flowering initiated if the day length is sufficient. These flower year round regardless of day length if their other conditions are met e.g. P. citrina & its offspring P. ‘Adularia’. The most important of the other factors is probably the autonomous process of the plant trying to reach maturity whereby even if the usual triggers are lacking the plant may eventually flower, though probably with reduced vigour. From my own observations however P. actinia, for example, will not flower at all if it has not had flowering triggered by short day length & had enough foliage to ‘know it’. So just as some plants have to be vernalised, others may be more reliant on other external factors rather than autonomous ones. Perhaps within a few years we will know which Passiflora are affected by which factors & to what extent. If you grow Passiflora in pots they will do best in clay pots with broken bits of pot & sharp sand at the foot of the soil. The reason is that the clay surface is always negatively charged & the plants can pick up the positive ions easily off the clay surface. There are also yet to be identified genes which are sensitive to other factors, such as daytime temperature & probably the nutritional status of the plant with regard to both mineral & water uptake. 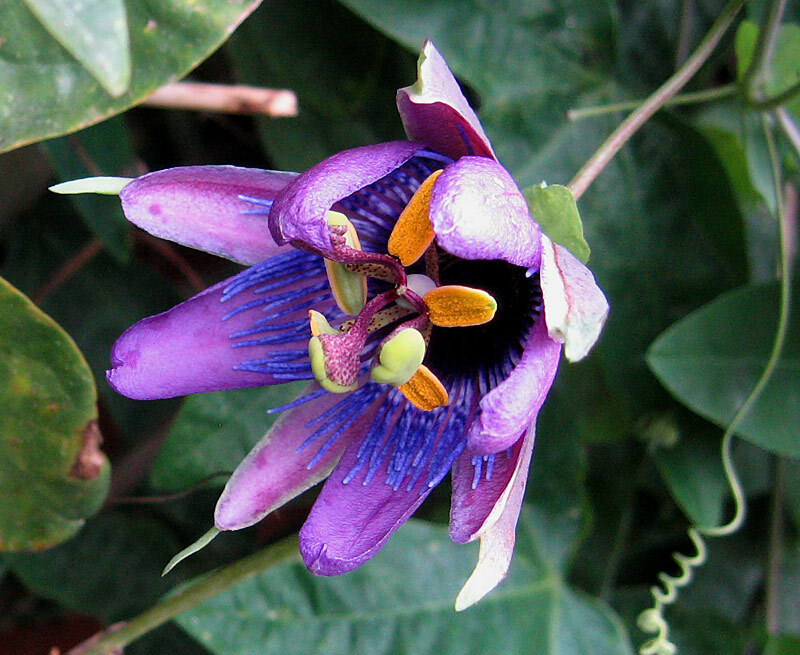 Many Passiflora, P. vitifolia for example, live in areas with wet and dry seasons. In the cool wet weather with medium light levels it will grow well and in the dry season growth will reduce and flowering start. It also likes plenty of calcium & magnesium. So many Passiflora although they may be from near the Equator are living under the canopy for the most part and need shade to make them want to grow upwards. When they reach the forest canopy (or lower if growing in gaps) the increasing amount of light and the stems trailing back down initiates flowering and in the case of P. vitifolia, gererally thought not to be self fertile, the flowers are then pollinated by hummingbirds such as Phaethornis superciliosus. Passion flowers are notorious for refusing to flower even when all other conditions are met if there is too much nitrogen in the soil – they are so comfortable that they just continue producing vegetative growth. Putting a plant under stress with lower nitrogen & higher potassium & erratic watering may speed maturity & flowering, as indeed may taking cuttings of a plant which can force it to flower earlier than the original seedling. There is also the question of whether the converse may happen, cuttings taken from a plant that may not have had the appropriate factors met, eg a very young plant or one grown outside its usual latitude, may never be able to switch off FLC & thus flower. Whether the plant is a species or hybrid may be relevant also. There is a little evidence that at least with regard to vernalisation the progeny cells will know if the parent cells have been vernalised.